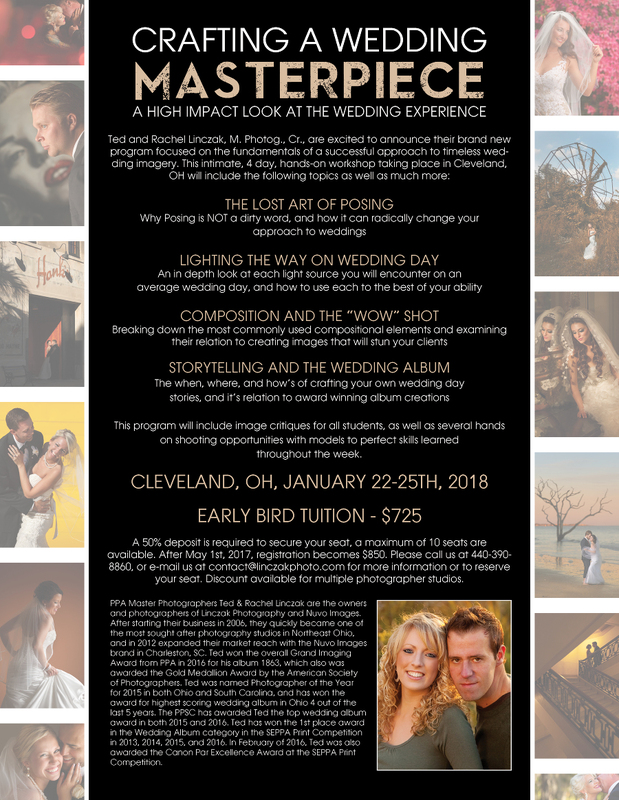 We Are Bringing Our Cleveland Wedding Photography Workshop to Northeast Ohio This Coming January, 22-25th, 2018, And We’d Love For You To Be There! Attention fellow wedding photographers! 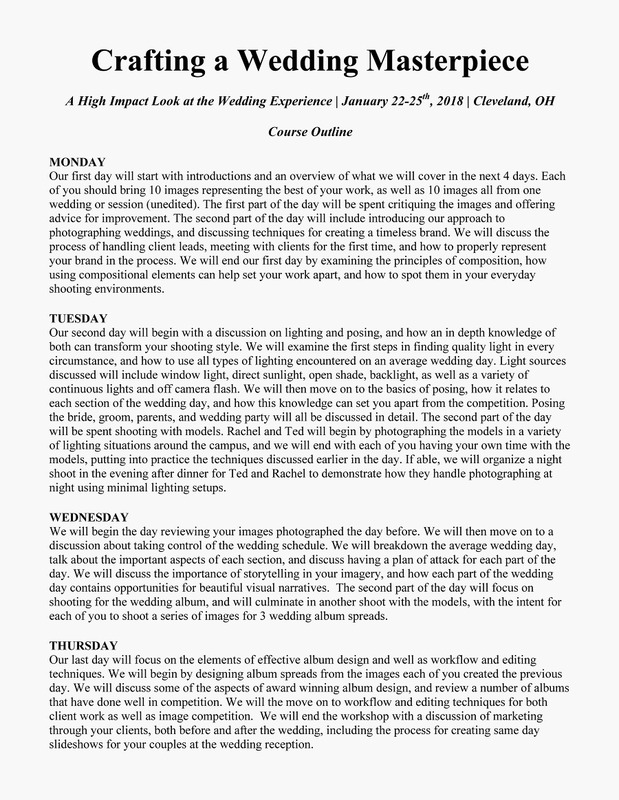 I’m excited to announce we will again be doing our 4 day intensive Cleveland wedding photography workshop in Ohio coming up this January 22-25th,2018. This will be 4 full days of education that will break down the entire wedding photography experience from beginning to end, with a huge emphasis on the craft of photography, and how to become a better overall image maker. Everything from client interaction, posing fundamentals, in an depth look at lighting techniques on location, composition principles, as well as album design theory and design will be discussed during this Cleveland wedding photography workshop. We will be doing live shoots on multiple days, and even an evening shoot midweek. As always we are going to have a great time! This class will run Monday January 22nd thru Thursday January 25th, 9am-5pm each day. We are offering an early bird tuition for this course of $725 for 4 full days if you lock your seat in by May 1st, 2017. After that the normal tuition price goes to $850. A $300 deposit is required to secure your seat, and this course will be limited to 10 students. We also have discounts available for multiple photographer studios. This is the 5th time we have offered this Cleveland wedding photography workshop in Northeast Ohio, and seats will fill up quickly! We have taught this course in multiple states over the past 6 years, if you’d like to hear from more past students about their experience, please contact us and when can forward you along that info. Please don’t hesitate to reach out to us if you any additional questions. We’d love to see you at this Cleveland wedding photography workshop! PLEASE NOTE: You do NOT need a PayPal account to secure your seat. If you DO NOT have a PayPal account, please select the “Pay with Debit or Credit Card” option after clicking on the link above. If you encounter any issues, please email us at contact@linczakphoto.com. Kelly Roberts - Hello. I am interested in this workshop but have very limited knowledge of off camera flash. Can you tell me what level of skill is needed with lighting to participate? Thanks!